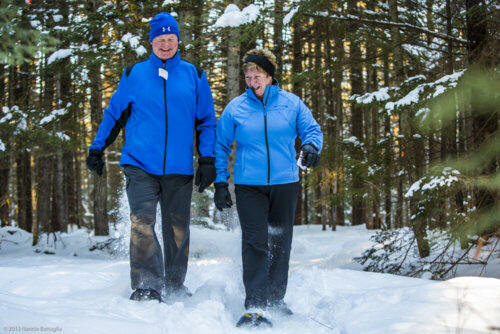 Lapland Lake Nordic Vacation Center has been named Number Four among the Top Ten Snowshoe-friendly Nordic Centers in North America by Snowshoe Magazine! Adirondack snowshoeing is a wonderful complement to cross country skiing, and you can enjoy both activities here at Lapland Lake! We have designed 12km of marked and mapped dedicated snowshoe trails that meander throughout our more than 200 privately-owned acres. Snowshoeing terrain ranges from flat to rolling hills to steep grades. 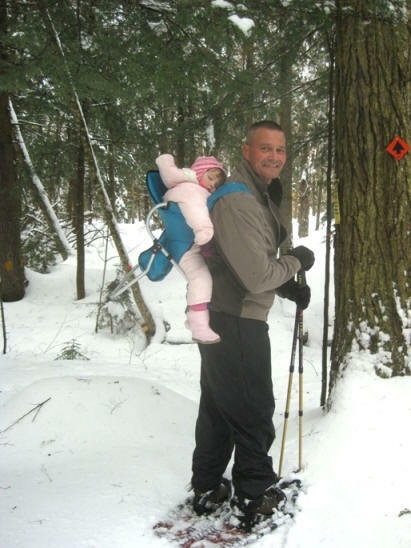 You will snowshoe through thick forests of pine, hemlock and hardwoods. Our trails occasionally take you over small bridges which pass over gorgeous creeks and streams. You may also opt to head off our property onto state-owned wilderness land. The 133-mile Northville-Lake Placid Trail is just minutes from Lapland Lake. This marked trail is a wonderful place to snowshoe (and to cross country ski). We recommend you sign in at the trailhead. Additionally, the 10km loop to Grant Lake, which may be accessed from our property, is a wonderful outing. If you plan to snowshoe off our premises, we advise informing ski shop personnel where you are headed and when you expect to return. If there is fresh snow, you will be certain to enjoy identifying the many animal tracks that you will see along the way. You may bring your own snowshoes or rent them from us. We carry a variety of manufacturers’ snowshoes including Tubbs, Havlick’s, Atlas and Little Bear for both children and adults. Please note: Snowshoeing is not permitted on our cross country ski trails (except where crossing a ski trail is necessary). Use of snowshoes will damage the groomed area of the ski trails and will negatively impact our cross country skiers’ experience. We thank you in advance for your consideration.